Vyomesh senses Krishna around. 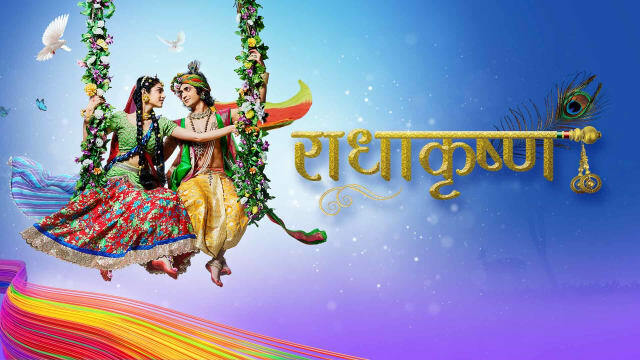 Krishna thinks he will sense him only if he wants to and tells Radha that Vyomesh is losing his control. Radha asks if he will be harmed. Krishna says nothing will happen to him. Vyomesh provokes Krishna to come out and accept his challenge and show his machoism. He senses Krishna all around and says why he is he senses Krishna all over. Krishna says he is all around and comes in front. Vyomesh says Radha was right, he is here itself. Krishna asks to try catching him. Vyomesh runs behind him and fails. Krishna laughs on him. Vyomesh boasts that he does not know him, he is monster Vyomasur with immense powers, if he had known, he would not have dared to provoke him. Krishna says even he would not have provoked him if he had know who is he. Yashoda reaches home silently. Nand asks why is she coming silently hiding. She says she did not want to disturb sleeping family members. Nand confronts that she had gone to his enemy Vrishbhan’s house who alleged him wrongly, he saw her crossing Barsana’s border with 2 girls’ help. Yashoda says those 2 girls are their sons Krishna and Balram. Nand is amused to hear that. Vyomesh/Vyomasur continues attacking Krishna. Krishna escapes repeatedly showing his false image, then comes in front and requests not to harm him, he realized his powers. Ayan and Jatila reach there. Krishna pleads them to save him. Jatila tells Ayan that they should stops Vyomasur before everyone sees his real face. Vyomesh attacks Krishna, Ayan rescues Krishna on time and asks if he is fine. Krishna acts and thanks him and Jatila for rescuing him. Jatila walks in front of Vyomasur and request him to go away before anyone notices him. He says king Kans wants Krishna dead or alive, he will kill Krishna and will present him to Kans. He attacks Krishna again. People gather seeing monster. Vrishbhan asks what is happening. Radha says Vyomesh is Vyomasur. Vyomesh takes his monster form. Yashoda informs Nand that Krishna told a big disaster is awaiting Barsana, so he asked whole Vrindavan to help Barsana. Guards inform Nand that a monster has attacked Barsana. Nand says he will protect his friend Vrishbhan and Barsana and orders gather whole Vrindavan vasis and with weapons head towards Barsana. Vyomesh continues creating havoc. Balram tells Krishna it is time to end Vyomasur right here. Krishna says they should send villagers to safe place first. Vyomasur captures Radha. Vrishbhan goes to her rescue. Balram rushes to help him, but Krishna stops him and says they should not interfere when 2 friends are reuniting. Vyomasur attacks Vrishbhan and he falls aside. Nand comes to his rescue. Vrishbhan gets emotional. Vyomasur lifts Radha and flies away. Krishna thinks Vyomasur dared to kidnap love devi, he will be killed today for sure. Krishna gives moral gyaan that nature has given human a special power than others, memory power which helps human a lot, it even gives bad experience to human, which leads human to the path of revenge; one should use memory for good memories for peaceful and better life. Precap: Vyomasur takes Radha to universe and says Krishna cannot rech h ere. Krishna reaches there on Seshnag/Balram’s head and says arrogance destroys biggest warriors, Vyomasur’s arrogance is ending him today.